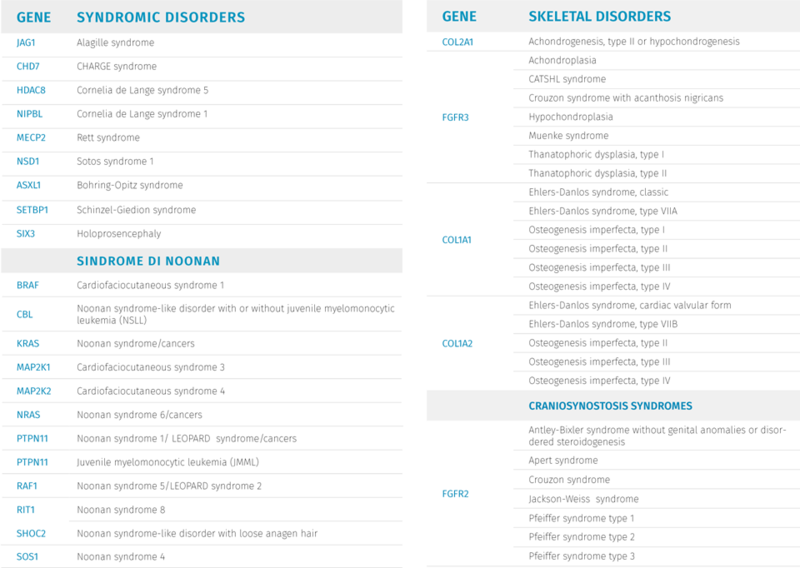 GeneSAFE™ DE NOVO screens for 44 severe genetic disorders due to de novo mutations (a gene mutation that has not been inherited) in 25 genes that cause skeletal dysplasia, congenital heart defects1-3, multiple congenital malformation syndromes4,5, neurodevelopmental disorders, such as autism6,7, epilepsy8, intellectual disability9,10, and sporadic cases of various rare dominant Mendelian disorders, such as Schinzel-Giedion syndrome12, and Bohring-Opitz syndrome13. The genes screened by GeneSAFE™ DE NOVO and the related diseases are described in Table 2. Table 2. Genes and genetic disorders screened by GeneSAFE™ DE NOVO. Many disorders screened with GeneSAFE™ DE NOVO are not typically associated with abnormal prenatal ultrasound findings (especially in the first trimester), or may not be evident until late second/third trimester or after delivery. Furthermore, family history is not a good indicator of risk for these conditions, which are commonly caused by de novo (not inherited) mutations, that cannot be detected by standard carrier screening as these mutations are not present in the parents. In addition, genetic disorders screened by GeneSAFE™ are not detectable with current NIPT technology. While traditional NIPT screens for conditions typically associated with advanced maternal age (e.g. Down Syndrome), GeneSAFE™ DE NOVO screens also for genetic disorders that are associated with advanced paternal age (men that are >40 years old)14. Disorders associated with advanced paternal age typically are caused by errors (mutations) in DNA arising during spermatogenesis. As a man ages, the chance for these errors to occur substantially increases. Several genetic diseases show a stronger association advanced paternal age. For example, the risk for some genetic disorders, such as Achondroplasia, is up to 8 times higher in fathers with advanced paternal age. Other genetic diseases associated with advanced paternal age are Pfeiffer syndrome, Crouzen syndrome, Apert syndrome, thanatophoric dysplasia and Osteogenesis Imperfecta. GeneSAFE™ DE NOVO is now the first non-invasive prenatal screen to detect disorders with an increased prevalence linked to advanced paternal age, ensuring a more comprehensive screen for a couple of advanced age. GeneSAFE™ DE NOVO screens for conditions common across all maternal ages. All pregnant women – regardless of age – are at equal risk for the genetic conditions screened by GeneSAFE™ DE NOVO. Although, the occurrence of each disorder is relatively rare, the cumulative rate of occurrence of these conditions (~1 in 600 or ~1 in 300, for mutations causing development disorders)15 is similar to that of Down Syndrome, in younger women. 11. Ng SB, Bigham AW, Buckingham KJ, Hannibal MC, McMillin MJ, Gildersleeve HI, Beck AE, Tabor HK, Cooper GM, Mefford HC, Lee C, Turner EH, Smith JD, Rieder MJ, Yoshiura K, Matsumoto N, Ohta T, Niikawa N, Nickerson DA, Bamshad MJ, Shendure J: Exome sequencing identifies MLL2 mutations as a cause of Kabuki syndrome. Nat Genet 2010, 42:790–793. 12. Hoischen A, van Bon BW, Gilissen C, Arts P, van Lier B, Steehouwer M, de Vries P, de Reuver R, Wieskamp N, Mortier G, Devriendt K, Amorim MZ, Revencu N, Kidd A, Barbosa M, Turner A, Smith J, Oley C, Henderson A, Hayes IM, Thompson EM, Brunner HG, de Vries BB, Veltman JA: De novo mutations of SETBP1 cause Schinzel-Giedion syndrome. Nat Genet 2010, 42:483–485. 13. Hoischen A, van Bon BW, Rodriguez-Santiago B, Gilissen C, Vissers LE, de Vries P, Janssen I, van Lier B, Hastings R, Smithson SF, Newbury-Ecob R, Kjaergaard S, Goodship J, McGowan R, Bartholdi D, Rauch A, Peippo M, Cobben JM, Wieczorek D, Gillessen-Kaesbach G, Veltman JA, Brunner HG, de Vries BB: De novo nonsense mutations in ASXL1 cause Bohring-Opitz syndrome. Nat Genet 2011, 43:729–731. 14. Kong A, Frigge ML, Masson G, Besenbacher S, Sulem P, Magnusson G, Gudjonsson SA, Sigurdsson A, Jonasdottir AA, Wong WSW et al. : Rate of de novo mutations and the importance of father’s age to disease risk. Nature 2012, 488:471-475. 15. McRae J, et al. : Prevalence and architecture of de novo mutations in development disorders Nature 2017: 542:433-438.